This may provide some clarity on the Sam Darnold standoff: While the offset clause remains an issue, the major sticking point, as I understand it, is default language pertaining to guaranteed money. Under the Jets' proposal, Darnold's entire guarantee will void if he's fined by the league for discipline or conduct on/off the field. This is different from the Baker Mayfield and Josh Allen contracts. In their cases, their guarantee voids with a suspension, not a fine. Big difference. 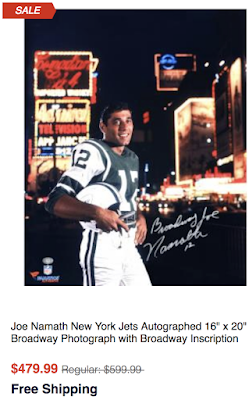 The Jets' approach is unusual based on recent history. It's believed that, in the last 10 drafts, no top-3 pick had voidables tied to league fines. This may sound petty, but Darnold has a $30 million guarantee over the life of the proposed contract. Jets-Dolphins Sun. 9/16 Securely Through Stub Hub. A few non-quarterback takeaways from the Jets' first practice: RB Eli McGuire left with a foot injury. No word on the severity ... WR Terrelle Pryor and S Marcus Maye sat out as they recover from old ankle injuries. Doug Middleton replaced Maye with the first team. The coaches really like Middleton ... Overall, a sloppy practice. Too many penalties. Sound familiar? ... Good day for the tight ends. Maybe there's more there than we think. Rookie Chris Herndon can stretch the seam ... CB Rashard Robinson, facing a suspension, sloppy with technique ... WR Quincy Enunwa looked good. Josh McCown said Enunwa reminds him of Anquan Boldin. Lofty praise. A few takeaways from yesterday: Nice day for DE Leonard Williams, who was unblockable at times ... CB Derrick Jones was around the ball a couple of times, intercepting Josh McCown once in a 7-on-7 period ... Rookie DE Nathan Shepherd had another strong practice. He blew by G James Carpenter in a pass-rush drill. Curious to see how he does in pads ... WR Jermaine Kearse had a Jackie Smith moment, butchering a wide-open pass in the end zone. At least it was practice, not a Super Bowl ... Penalties continue to be an issue on both sides of the ball. Well, at least they're getting stronger, thanks to the penalty pushups. Jets aren't always right, but they're absolutely right in this case. Sam Darnold probably should have taken similar tack as Baker Mayfield, Josh Allen & Josh Rosen, who all made it clear missing any practice simply wasn't an option. But this is mostly about one agent's ego. The two sides are at odds over language in the contract. The main issue is offsets. The team wants offsets in the deal. Darnold and his agent do not. Offsets protect a team if a player is cut and then signs with another team. It allows them to deduct the salary the player receives from a new team from what they owe him. Players want to collect full salaries from both teams. Darnold and Bears linebacker Roquan Smith are the only remaining unsigned rookies. Both Baker Mayfield and Josh Allen, the other top quarterbacks taken, signed contracts this week that included offsets.There is no dispute about what Darnold will be paid because rookie contracts are slotted under the current CBA. 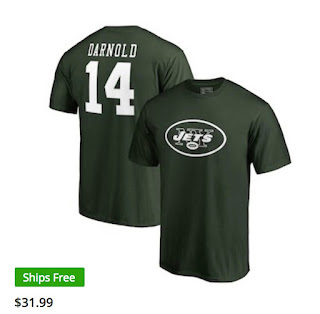 Darnold is scheduled to make around $30 million guaranteed over four years with a $20 million signing bonus. The team also holds a fifth-year option for all first-round picks. See Sam Pass! See Sam Run! See Sam Win! Is there a better gift this year? …..Patriots Troy Niklas was released after just two days of training camp, which is a bit of a surprise. The big tight end was in competition to get one of the backup slots. The team signed WR Paul Turner who spent four games with the Eagles in 2016. In other moves this week, the team signed safety Eddie Pleasant, guard Nate Theaker and WR Devin Lucien while releasing safety David Jones…..The Buffalo Bills have three QBs vying for reps in training camp and into the preseason this summer and it’ll bear watching this summer. Top draft choice Josh Allen signed his contract and is in camp, the team traded for A.J. McCarron with the Bengals and have veteran Nathan Peterman who was thrown into a disastrous first start last year but bounced back nicely after that.McCarron led Alabama to a national title but this is his first opportunity to start. He’ll try to hold off Peterman and the rookie Allen. Allen is their QB of the future, but Bills coach Sean McDermott has made it clear, that the team won’t push their future QB into game action before he’s ready. That’s why they brought in McCarron. When it comes to arm strength, Allen is head and shoulders above the other two, but as we’ve seen, playing QB in the NFL is much more than that or else Jeff George would be in the Hall of Fame…..The Miami Dolphins are trying to work Danny Amendola in the slot where he was so valuable for the Patriots the past few years. And QB Ryan Tannehill, who missed all of last season with a torn ACL is working hard to build his chemistry with the tough but diminutive wide receiver.But not everyone is happy with the work being turned in by the Dolphins QB. Dolphins beat writer, Omar Kelly who is known for his over the top tweets was writing that Tannehill is leading Amendola into a huge collision. “Every single media member has CRINGED watching some of the passes Tannehill throws Amendola. If the action were live Reshad Jones and T.J. McDonald would break his ribs, or give him a concussion. Ball placement is a very important trait a QB needs, ask Dustin Keller.” Kelly added, “And for the record, I predict Reshad Jones and T.J. McDonald will be head hunters (sic) in this defense….if the refs allow it. Both make great jumps on plays and bring the sledge hammer. Problem is, the NFL doesn’t want those hits in the game anymore. We’ll see.”…..Pro Football Weekly’s Bob LeGere and Hub Arkush think that Patriots RB Sony Michel will have the biggest impact in the AFC East…..